Without a shadow of a doubt, it’s possible to say that black dresses are and will always be an eternal fashion favourite. Ever since Givenchy shone a spotlight on it in Breakfast At Tiffany’s, the ebony garment has gone on to become the gold standard of evening wear. The black dress has continued to stay relevant through the decades with constant reinvention. Years may have passed since Audrey Hepburn first donned it but the iconic ensemble continues to stay more popular than ever. Bollywood too is a lover of the chic black number. Case in point: Bhumi Pednekar at her most recent appearance. For an interview, the B-town actress stepped out in a black dress that wasn’t quite little or like the standard number we had in mind. Bhumi’s black dress came with a surprising twist unlike anything we’ve seen before. For her appearance, Bhumi wore a mid-length black dress by designer Shahin Mannan. From the bottom, you’d think it was like any other but reach the waist and that will change. Over the neckline is a triangular glittering rainbow accent that finishes off with an insect motif in the centre. Bhumi paired this with a pair of black pointed pumps and dangling Mahesh Notandass earrings. The striking ensemble was paired with a neutral makeup look, sleek tresses and red nails. It’s a bold look built on such a classic piece. Shahin Mannan’s rainbow insect midi dress brought enough colour to leave us spellbound while transforming the iconic black number. 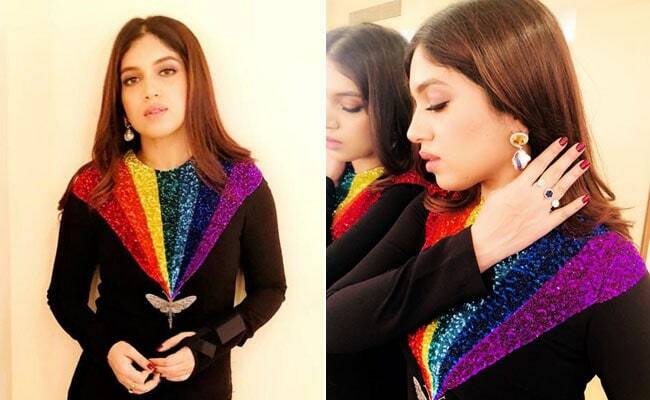 Styled by Sukriti Grover and accessorized crisply, it has definitely propelled Bhumi Pednekar to the top of Bollywood’s current list of stylish statement-makers.